DEBORAH CROMBIE: Once or twice a month, I pop into my local Barnes and Noble and peruse the magazine racks. I'm usually going for the British home magazines, the things I can't subscribe to, but I often pick up something completely unexpected. And I love looking at all the variety of things that interest people. Entertainment, sports, music, fashion, electronics, cars, writing, journaling, gardening, cooking, quilting, the list goes on and on. 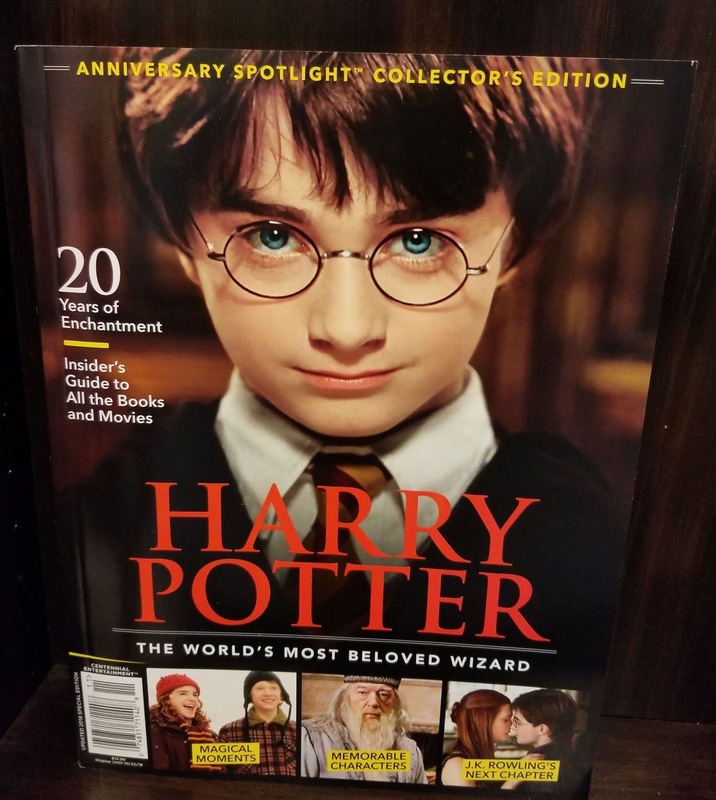 There are even magazine devoted to a single subject, like this one celebrating twenty years of Harry Potter. (I was tempted, but resisted.) Or what about this one for airbnb? Doesn't that make you want to pick it up? I had no idea there was such a thing. 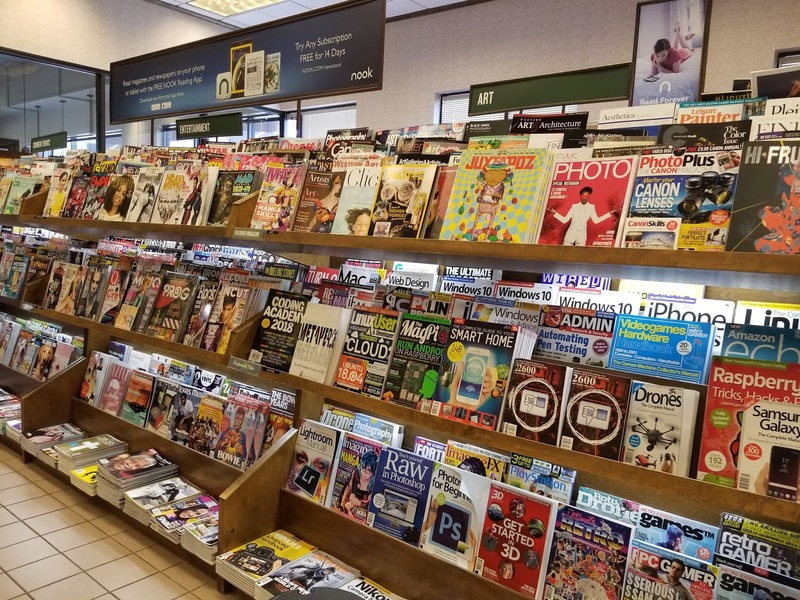 The bookstore tells me that they don't make any money on magazines, that they serve merely to get people into the store. And I have to admit that, having gone in for a magazine, as often as not I'll end up buying a book, too. We subscribe to several, too. THE ECONOMIST (which Rick reads cover to cover), ROLLING STONE, and REAL SIMPLE. But the magazine business is suffering in the digital age. Just last week the news broke that Conde Nast is selling three of its imprints, GOLF DIGEST, BRIDES, and W. And they are downsizing their operations and staff on their remaining publications. VOGUE is producing very successful YouTube videos, which is hoped to make up some of the print losses. I know you can get digital subscriptions for most publications these days, and I don't want to sound like a Luddite, but for me the experience is just not the same as opening up a glossy magazine and turning the pages to see what's inside. That's physical, visceral, and it always feels like a little mini escape to me, something pleasurable I can lose myself in for a slightly guilty half an hour. Here's one I discovered on last week's outing--isn't it gorgeous? You should see the inside, I'm swooning every time I open it. What about you, REDS? Do you still read magazines, and if so, which ones? LUCY BURDETTE: Oh how I love magazines, though I'm afraid I don't subscribe to any at this point other than my alumni mag. I used to get cooking magazines, golf magazines, LADIES HOME JOURNAL, MS, and more. They are perfect for times when you can't commit to a book. However--living in two places, it's too hard to keep up with the mail. These days mostly I buy them in airport bookstores. HALLIE EPHRON: I used to read PEOPLE magazine in the dentist's office, buy it at the airport, but now I don't recognize anyone in it so I pass. I don't even read it it while I"m waiting the checkout line. But I subscribe to THE NEW YORKER and read it regularly. Invariably it has an article on some arcane topic that I didn't think I'd be interested in, and more than once an article in it has inspired a story idea. Like one about how people can be trained to read facial expressions to tell if someone is lying. And the series by Ronan Farrow on Hollywood sexual misconduct has been riveting. Nowadays you not only get the magazine delivered, every other week or so, there are a ton of in-between stories that come via email. INGRID THOFT: I love, love magazines! One of life’s small pleasures is opening my mail box and finding the latest PEOPLE, NEW YORKER, REAL SIMPLE, VOGUE, VANITY FAIR, IN STYLE, I could go on and on. Digital mags just aren’t the same; you can’t curl up on the couch with your tablet and experience the same relaxed state! One of my magazine secrets? Mags for Miles is constantly sending me notices to trade in some of my frequent flyer miles for subscriptions. What better use of the 1,000 miles from JetBlue, and the 2,500 from United that will never add up to even the shortest flight? RHYS BOWEN: Count me in as a fan of magazines. We still get NATIONAL GEOGRAPHIC which is my go-to bedtime reading, NATIONAL GEOGRAPHIC TRAVELER, another travel magazine, CONSUMER REPORTS, but when I'm at an airport I always pick up a trashy women's magazine. You know, the sort that promise you can lose ten pounds by eating popcorn. Sorry, but I can't stand PEOPLE. Maybe it's because everyone featured is a sort of pseudo-celebrity and they are all showing their baby-bumps! My absolute favorites are when I am in England and my sister-in-law subscribes to COUNTRY LIFE and I drool over all those fantastic properties for sale.... "Look John, we could afford this one. Twenty acres, ten bedrooms, and only one million pounds. But it is in the Outer Hebrides." I really miss TIME and LIFE. READER'S DIGEST used to be a lovely slice of Americana, but has become so slight in content that it's not worth it... if it even exists any more. JENN McKINLAY: There is an embarrassment of riches of magazines in my house. Between us, Hub and I subscribe to NATIONAL GEOGRAPHIC TRAVELER, VANITY FAIR, THE NEW YORKER, ESQUIRE, SURFER, CIVIL WAR TIMES, YANKEE, ALL RECIPES, and VOGUE KNITTING. And then there is our monthly excursion to B & N where we buy MOJO, UNCUT, and KNITTING MAGAZINE (all of which are British periodicals) and various guitar magazines. So, yeah, small magazine problem, here. JULIA SPENCER-FLEMING: I understand that digital media is superceding print, but I've never seen images on my laptop that are as good as those in print magazines. I subscribe to HOME AND GARDEN and just got HGTV magazine as a birthday gift. (Yes, I am a basic white woman. #NoShame.) The Smithie gets DOGSTER, CATSTER (both either Christmas or birthday presents) and received MONEY magazine from her grandmother right before she died. The Smithie told me every time she sees the magazine in the mailbox, it's like a message from her Grammy. That's the thing about actual print magazines - they make the best gifts. A bit of entertainment and education once a month, and then you can recycle it - nothing to sit around the house cluttering things up. HANK PHILLIPPI RYAN: Ingrid, Mags for Miles is a real thing? I thought it was some sort of scam. Thank you! As for magazines,I Iove them. LOVE. Because you can pretend you are really learning something, when really you are often just looking at photos. I always read THE NEW YORKER, though, and it's incredibly fascinating and always educational in the best of ways. And MYSTERY SCENE, which I love, and CRIMESPREE, and THE STRAND. But, Ingrid, can I come to your house? I love REAL SIMPLE, and VANITY FAIR, and VOGUE and IN STYLE. Exactly my faves. In fact, you have enticed me into subscribing. Huh. I read PEOPLE in the doctor's office, no matter if it's new or not, it's the only way I ever hear of some people. And I miss MORE, which used to be great. DEBS: I LOVE seeing what other people read! Jenn, I hearby declare you the MAGAZINE QUEEN, and your hub the MAGAZINE KING. But, really, tell us, which of you reads CIVIL WAR TIMES and which reads YANKEE? And is there a household battle here? READERS, are you still in love with print? Tell us your faves! I haven't subscribed to a magazine for years. The only one I subscribed to as an adult was TV Guide. I would read it as soon as it came in every week. But when the "guide" part turned into almost impossible to follow charts instead of actually telling me what was on, and what was new vs. reruns, I let my subscription lapse. I found a different TV news site on line, and my DVR records the shows I tell it to record (I was using a VCR to record things when I subscribed to the magazine.) And I find that I don't miss it. Plus it gives me more time for books. I have a friend who has collected TV guide from the day it began… He has every single issue ! Mark, the first thing I do when I arrive in the UK is buy a copy of Radio Times (which also has all the daily TV listings AND fun articles.) My Brit friends make fun of me for this, but I love it. I go through it with a pen and mark all the things I want to watch. I was also a huge fan of TV Guide when I was growing up. But it really doesn't serve the same purpose these days as it did back then. 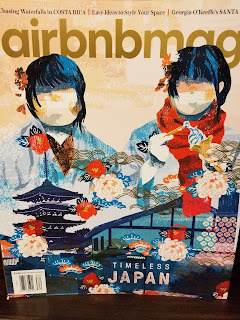 Airbnb has a magazine? Who knew? Oh, yes, we do indeed read magazines. And I agree, Debs . . . the digital editions are a poor substitute for the real deal that I can hold in my hand. What do we read? AIR AND SPACE, ASTRONOMY, SMITHSONIAN, GUIDEPOSTS, NATIONAL GEOGRAPHIC, and DISCOVER . . . . In our house it’s the New Yorker. Once in a while julie picks up a vanity fair and I head right for real simple and the architectural digest at the dentist office, where I spend too much time. I send old issues across the drive to my neighbors. We get Time here, although I rarely read it myself. I ordered it through Mags for Miles for years, but when I got my annual order form this year it wasn't an option. And Hank, you crack me up. You really thought Mags for Miles was a scam? If it is they're getting something from me, although I'm not sure what (I've never bought any of their paid options). 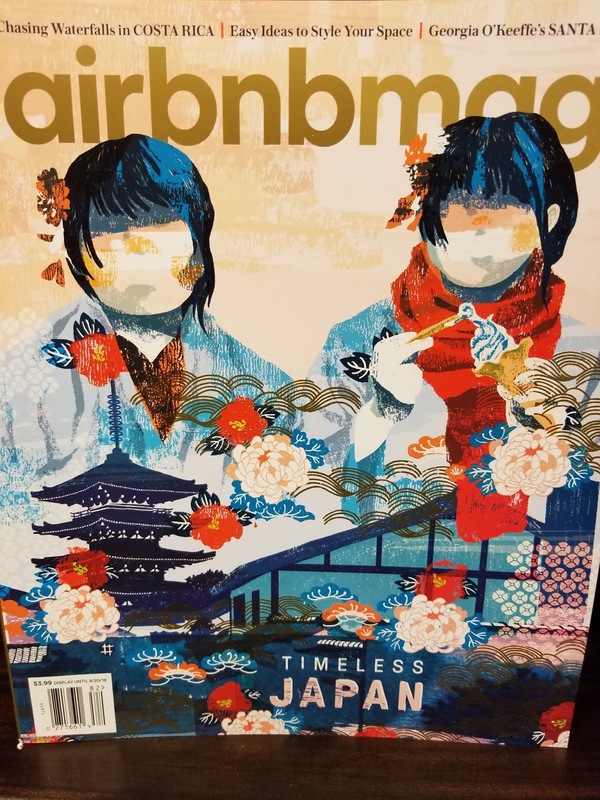 Yes, it just looked scammy to me :-) — Like the airlines sent it out to get you to use your miles for magazines, and not for seats. I'm sure it's a lot cheaper for the airlines. Otherwise, why would they offer it? But like Ingrid said, I have some miles with airlines I rarely fly and would never accumulate enough for a free flight so I might as well get something! I'd never even heard of Mags for Miles. Does American offer it? I have loads of American miles. Yes, it can be a bargain! We had a long-time subscription to Sports Illustrated for Ross and the Sailor which I got through them. What else are you going to do with your measly 2ooo miles? We decided to use our air miles for Amazon gift cards, then we could use them for BOOKS. We don't fly much any more, but for a while there we were getting hundreds of dollars in Azon stuff. Oh, how nice, Rick. I've browsed through the gift cards available with Southwest points (their version of miles and the airline I usually fly) but didn't see anything interesting. I'd love it if they offered Amazon gift cards. We have subscribed to The New Yorker for forty some years. My husband and I joke that we never read the same articles. I love Vanity Fair. But every issue makes me miss Dominick Dunne. We only subscribe to the New Yorker, and it's the only nonfiction I read unless I'm researching something for the late 1800s. Amazing the stuff you can learn in those New Yorker pages. I love magazines but don't buy nearly as many as I used to unfortunately. Two magazines that I had to give up most recently were the tourism mags Ireland of the Welcomes and Scotland the Magazine. I just don't see myself ever getting there. Mystery Scene - Of course! I loved the magazine even before getting to write reviews for it. I don't subscribe via mail but rather pick it up at the local magazine shop Newsbreak that I shop at. Sports Illustrated - I have been a subscriber since I was 12 years old or so. I also get British music magazines Classic Rock and Rock Candy. On occasion I get a copy of Star Trek The Magazine or Back Issue (a magazine devoted to comic books of the past). And you should definitely subscribe! I do most of my New Yorker reading on the elliptical machine at the gym! I harbored a dream for a long time of getting to visit Ireland, Scotland and England. But it won't happen so I let the subscriptions lapse, first Scotland then Ireland. The only magazine I currently receive is Ireland of the Welcomes. I’ve been to Ireland 3 times & loved it so much that the wonderful photos & other content of each issue helps keep my lovely memories alive. The only magazine I still subscribe to is Mystery Scene. I used to have Good Housekeeping and People and Redbook and Reader's Digest and I can't remember what else. Lots. However, they changed and I changed and now...not so much. I do agree that looking at them digitally is just not as satisfying - at all. We don't get a newspaper any more either except the little local paper that comes out twice a week. Another Mystery Scene devotee! YAAY! I find reading articles on the computer is fine. I dip into stuff from The Atlantic and New York Magazine all the time. (Guilty hanging of head because I don't subscribe.) Its when pictures and graphics are involved that the print editions become so superior. Now that the kids are gone, the New Yorker plus all the science magazines my husband receives. When we lived in Atlanta I subscribed to Southern Living to learn about places to go, recipes, and gardening. Margaret, I snag Southern Living from the library every month--enjoy Rick Bragg and the Grumpy gardener the most, as well as the recipes. Over the tears, I've gotten gift subscriptions to Southern Living on and off from my aunt in Tuscaloosa. I confess I've saved ALL of them, and scour them for recipes for special occasions. Love that magazine. Southern Living has always been a popular magazine in my family. The recipes are great, and the rest of it--decor, travel, and gardening pics--are a relaxing look and read for me. I get my magazine fix through the library--for all the reasons stated here--when I'm bone-tired and too frazzled to give a book the attention it deserves, there's nothing like a magazine (with pictures!). I read the ladies mags, the science mags, archaeology & history, cooking, news. Used to subscribe to poetry and others. My absolute favorite was Tricycle--a Buddhist magazine. Cover to cover, for all of them. Digital just doesn't cut it. Oh, I miss Gourmet, too! I subscribed for about twenty years. I still use recipes I got from those issues. I *love* digital magazines! Right now I subscribe to The Saturday Evening Post. I buy individual digital issues of Doctor Who and Ellery Queen when they have something I want to read. I read them on my iPad so the photos are wonderful and, best of all, I don't have to deal with recycling the printed copies or having them around to add to the clutter. Magazines on a train journey. In my youth in London, going away for the weekend would involve buying a return ticket and leaving enough time to visit the magazine stand to chose a treat plus chocolate. Now at home I peruse the New Yorker, daughters alum mag and the CDSS magazine which has changed its stripes from a folded foolscap size to the real thing with color and all. He reads The Sun, beautiful, disturbing photo on each cover. By this time in my life the thrill of the real magazine is post as I worry about recycling and climate change. But I do remember buying my first Gourmet when I arrived in the USA and subscribing for at least fifteen years. I even built a small, very small catering co. on their backs. My local transfer station director says magazines are compostable after shredding, Celia! Magazines go in either the recycle or the compost bin, Celia! Recently my sister gave me a copy of NEW YORK Magazine which I hadn't looked at in years, and it was excellent. Seems like a perfect purchase for a plane or train ride. We buy that once in a while, great if we're going into the city. Interesting here how many people read the New Yorker. It is the epitome of fine magazines for me even though I am not wild about the city. Does that a deal breaker here? We've had a print subscription for eons, and I give the issues we've read to our neighbors. In the past couple of years, the cost has been worth it just for the covers! I do miss my print newspaper, especially on Sundays. But magazines? Nope. They are fun to look at in the store, but I never get around to reading them or recylcing them and they clutter everything. At least with the newspaper I could save it for the winter to use with kindling to start a fire. I subscribed to TEEN VOGUE for The Girl. They keep sending it, even though I let my subscription lapse ages ago. Now she gets VOGUE (another one they keep sending even though I didn't renew the subscription since she's leaving for college). And then she started getting GLAMOUR. I don't know what that is because I never subscribed to that one. And yes, all the issues are stacked on her bookshelves in her room, taking up space. I've seen some very good editorial pieces from Teen Vogue in my newsfeeds the last couple of years. Surprised me. That was the major reason she wanted a subscription. It's not all makeup tips and how to snag the best boyfriend any more! I think we have to subscribe to The New Yorker. But I can't tell what it costs after the introductory 12 weeks. to allow magazines and newspapers to pile up, I read most publications on my cell phone. 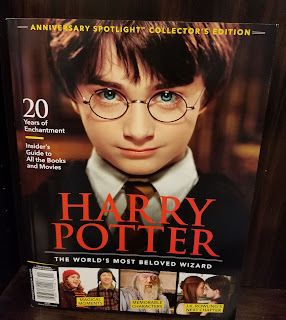 I still have several print subscriptions, and I purchase individual copies of magazines at Barnes and Noble when I see something that interests me. For me, it's much easier to handle reading publications on the phone, (Never thought I would say this!) I appreciate having choices. You read magazines on that little tiny screen? Really? That's just amazing to me. Sometimes I turn the phone so I'm getting a landscape view of the page, which can be easier on the eyes. Last year I forgot to renew a magazine subscription. When I realized it was available on line, along with additional material, I decided not to go back to the print version. I began reading other publications on the phone as well. I love this post!, Debs Hub reads Civil War Times (his dad is a Civil War historian and they discuss) and I read Yankee. Isn’t it perfect? I’ve been in AZ for 25 yrs but I’ll always be a CT Yankee at heart. Jenn, my mom and dad had a subscription to Yankee. I tried to read it but it wasn't all that interesting to me, so that lapsed after she passed. My parents subscribed to "Yankee," too! For me, it’s like visiting home plus I set books in CT and ME - research! So that makes the subscription fee tax deductible, right? I'm traveling on Friday, and I always try to be early enough for a flight to browse through the airport news stands. I wonder what will tempt me? Vanity Fair? Bon Apetit? Smithsonian? Magazines are so perfect for plane flights. I used to read lots of magazines but I just don't anymore. People magazine! Who are those people? I think some might be famous for being famous. I still do subscribe to Reader's Digest because there has to be something in the bathroom to read! "I think they might be famous for being famous." Best line I've read lately! We subscribed to the New Yorker for decades, and I still read it online sometimes. Weirdly, even without a subscription, they send me links a couple times a week. I used to get Threads, and was one of their writers for a couple years. I dip in again now and then, and buy individual issues when sewing friends have articles. I love InStyle, and became a fan back when they showed how to get the same look in age range-appropriate ways. I was wondering the other day if I should resubscribe to Mother Earth News or Herb Quarterly. They both have great gardening ideas, as does Fine Gardening. I decided to go to the library to read them, and a friend said some of the branches have stopped stocking magazines. That was a shock. We do read AARP, and a friend passes along his mother's copies of English Cottage Gardens and Garden & Gun. Which is a fantastic magazine, especially for recipes and travel ideas, clothing and home decor, focused on the American South. Similarly, Cowboys & Indians for the same about the American West. I love magazines, but stopped subscribing about 15 years ago, because I just can't throw them out. I sometimes buy a National Geographic, and I still have a pile of National Geographic Traveler that will be in my estate sale someday. Our library allows patrons to check out past issues of most magazines, so I go there to read some, and bring a few home. Since I have to return them, I know they won't be lying around forever. The Writer, Writer's Digest, Poets and Writers are my faves. I don't think they carry Mystery Scene. Also, the library has a magazine exchange table in the lobby where people can drop of magazines they don't want, and anyone can take them, for free. So I get a few that way, I and then usually take them back for someone else to enjoy....or recycle if they are old. I love the New Yorker and NG, Psychology Today, Scientific mags. 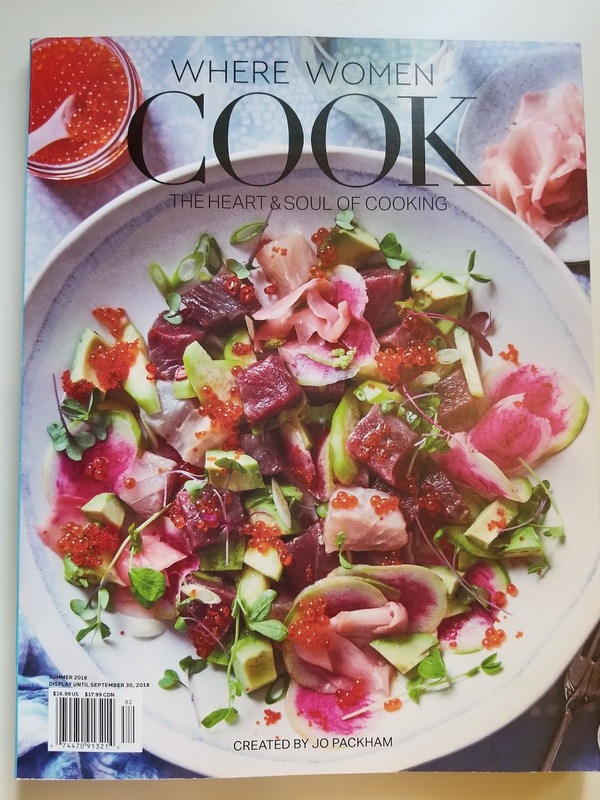 I haven't bought a Good Housekeeping in years, but I did pick up one at the exchange table, because it advertised a great chicken salad recipe. You should get your library to start carrying Mystery Scene! J, I confess I tend to hang onto my favorites. I would put our TIME magazine in the recycle pile as soon as the next issue arrived, but I have issues of Southern Living dating back to the early 00s! I used to read Mom's magazines: McCall's, Ladies Home Journal, and Redbook. Redbook used to have a summer issue that was all short stories and excerpts from novels. Loved it! Nowadays I've cut back on magazine subscriptions quite a bit. I just wasn't reading them in a timely manner. So, goodbye Smithsonian and National Geographic. Currently I get Southern Living and Texas Highways. I used to take Texas Monthly, but tired of some of the superlong articles. I will get free subscriptions to magazines through recycling points. I haven't renewed any of them yet. So I had a year of Cooking Light, one of Architectural Digest, and some travel magazine. Tried them out for a year for free. None of them grabbed my interest. I think I have yet another one lined up but I've forgotten what it is. I took Money magazine years ago but decided a lot of it was hooey. Entertaining, but hooey. I took some foodie magazine I really liked but it folded. Was that Gourmet? I used to love getting the Publisher's Clearinghouse stickers - you stuck them on the order form - TV Guide, US Weekly, Newsweek, Prevention, and others were some of my favorites. 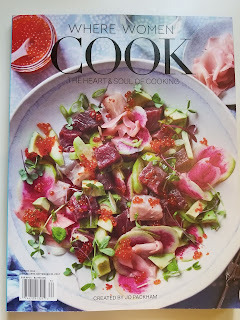 I loved Martha Stewart Cooks magazine which is sadly no longer in publication. I do not subscribe to any magazines these days. Mom used to subscribe to Better Homes & Gardens, Good Housekeeping, and Family Circle. Also Sunset Magazine...we really enjoyed when they would put something from our area in the magazine. Arizona Highways was a great magazine as well with stunning photography. OH I forgot I used to subscribe to National Lampoon and Rolling Stone in my younger days LOL. Also High Times, EasyRiders, Popular Mechanics, and Reader's Digest. We thought the mailman kept some of our magazines and delivered them late to us after he read them LOL!! I do love magazines, but I only subscribe to two right now, Vanity Fair and Good Housekeeping. I get a couple of others from my mother-in-law when she's read them, Southern Living and a bird magazine (can't think of the name of it and don't have a copy at this time). When flying, one of my favorite things to do before boarding the plane is to buy a copy of The New Yorker and possibly People or some other gossipy magazine. I enjoy history magazines, but that's the one area I usually read online now or buy books about the specific area of interest. I used to subscribe to National Geographic, and I'm not sure why I gave it up, but I did. I have ordered magazines for the granddaughters, but I need to check back in with them and see what they want now. I'm wondering if anybody else has had this happen. I am receiving a magazine like People, think it's Us (? ), but I never ordered it. My mother-in-law says she's receiving a couple of magazines she didn't order. It's not from agreeing to order subscriptions when I check out from a department store, as some of them ask you if you'd like to do that. I try to be careful online and not click anything that would result in receiving something I don't want. Anyone else? I think that’s how I got Architectural Digest. It just mysteriously started showing up. I never subscribed to it. You can get tons of magazine subscriptions totally FREE at Recyclebank.com. Totally legit, we do this a couple times a year. MYSTERY SCENE, WIRED, THE NEW YORKER, THIS OLD HOUSE, LOVE OF QUILTING, QUILTER, FINE GARDENING, HEMMING'S MUSCLE CAR, HORTICULTURE, PORTLAND. I read some other magazines at the library, such as POETRY. It's been a while since I paid any attention to the magazine rack at the market or book store, but maybe I should. I use magazines for short bursts of reading, such as while having a snack, or waiting somewhere. I love going to the mail box and finding a magazine there. I do, admittedly, read a couple of on-line periodicals, CLARKSWORLD and INTERZONE, both are science fiction. 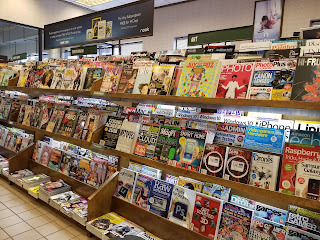 I suppose the day will come when physical magazines will disappear, that will be sad. I also suppose looking at the list people here post, that the magazines we read say a lot about who we are, or at least where our interests lay. I'm exactly like you. I love to peruse the British gardening and architecture magazines (well, anything British really because I've been an Anglophile since I was a little kid). However, I also Victoria; travel magazines; Mystery Scene; the Strand. I, too, prefer print. I like to hold a book or magazine in my hand, to feel it beneath my fingers. OK. I have read THE NEW YORKER since I was a child and have always had a subscription, even as a dirt poor grad student and teacher. My mother would buy us the occasional SEVENTEEN when my sisters were the right ages. When I returned from hitch-hiking through Ireland, I subscribed to IRELAND OF THE WELCOMES for years. Now the Mr. and I get THE NEW YORKER, TIME, THE ATLANTIC, and THE SMITHSONIAN. One of our nephews gives me GARDEN AND GUN. Don't laugh. It has great articles and Julia Reed is always worth a read and a laugh. I miss SOUTHERN ACCENTS and VERANDA. We used to get VANITY FAIR but then it became so Hollywood. I took GOURMET for years as well as ANTIQUES and FOLK ART. I miss print. We still take the paper newspapers. I subscribe to TV Guide, International Figure Skating, Prevention, National Wildlife, World Wildlife, and American Gardener. I buy Readers' Digest in the grocery store because I had trouble with my subscriptions. I pass all my magazines along to friends and family. Another thing you can't do with digital. You can't cut out articles or pictures either. I still miss Starlog. Print magazine addict here....between myself and Spouse: English Home, Real Simple, Taste of Home,Sunset, British Country Living and QuArterly issued Country Home (both purchased from B&N), Smithsonian, Teatime, Hotrod, Motor Trends, Fortune, Kiplinger News Letter, Money, Victoria: England, France, Scotland issues purchased from B&N, National Geographic Travelers,and Consumer Reports. Seeing this list in writing prompts me to think an intervention might be in order. I subscribed to Entertainment Weekly for years. I loved it. But then I'd get behind on an issue & then there is a new one that arrives every week. It got a little overwhelming, so I finally didn't renew the subscription. I don't subscribe to any magazines now. If there's anything that really catches my eye while in a store I'll pick it up, but that doesn't happen very often.